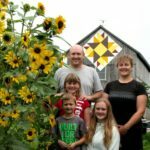 Our “Sunflower” barn quilt, a modified “Waterwheel” pattern gives tribute to the now silent mills that were built along “Big Creek” in the valley known as “The Klondyke,” just one kilometre east of the property. The early industrialization of the area included the Klondyke grain mill, built in early 1820. This era marked a period of major growth for Howard Township with other grist, wool, and saw mills also located along the creek. As land was cleared and Morpeth and Ridgetown were settled, a young McDiarmid family arrived at the port of Antrim in 1833. Two generations later, Archibald McDiarmid married Eliza Jane Serson and in 1893, they settled on this 100-acre farm. A small frame house was built, along with several barns, only one of which survives today. As the family grew, the current brick home was built in 1896 with the help of a loan from a neighbour. The fertile soil on this farm allowed Archibald to repay the debt within two months. The “Sunflower” on this quilt symbolizes that success. A century later, the farm was still in the McDiarmid name. In 2000, after raising the fourth generation on this homestead, Mrs. McDiarmid took up residence in Ridgetown. In 2011, Paul and Amber Sayers purchased the homestead, and renovated the home with the hope that their young family would continue to enjoy this property and honour its history for the next 120 years. The barn quilt was a family project.